Hot summer days call for cool refreshing desserts. Nothing too decadent, just light and simple sweet treats that leave you feeling satisfied. I like to use fresh fruits and citrus to create tangy combinations: strawberry + orange and blueberry + lemon are two of my favorites. 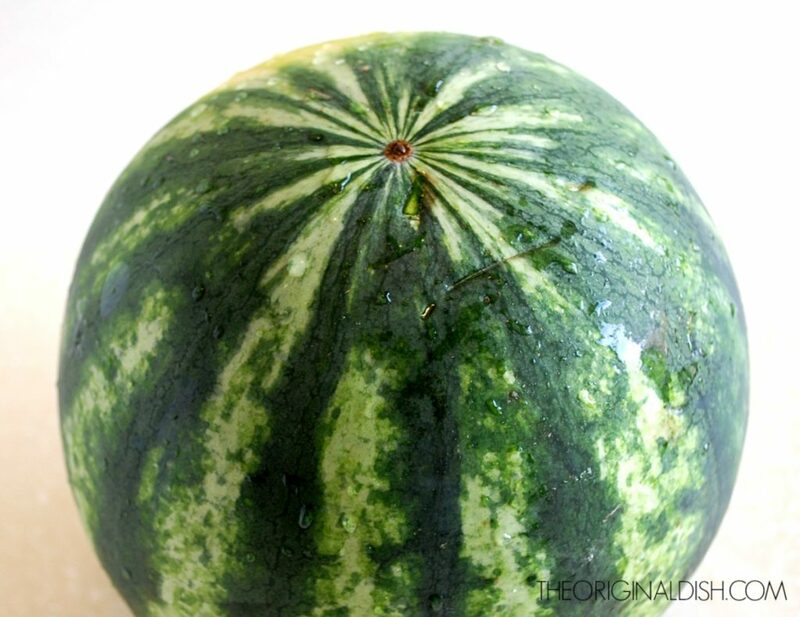 In this dish, I pair watermelon and raspberry with lime. 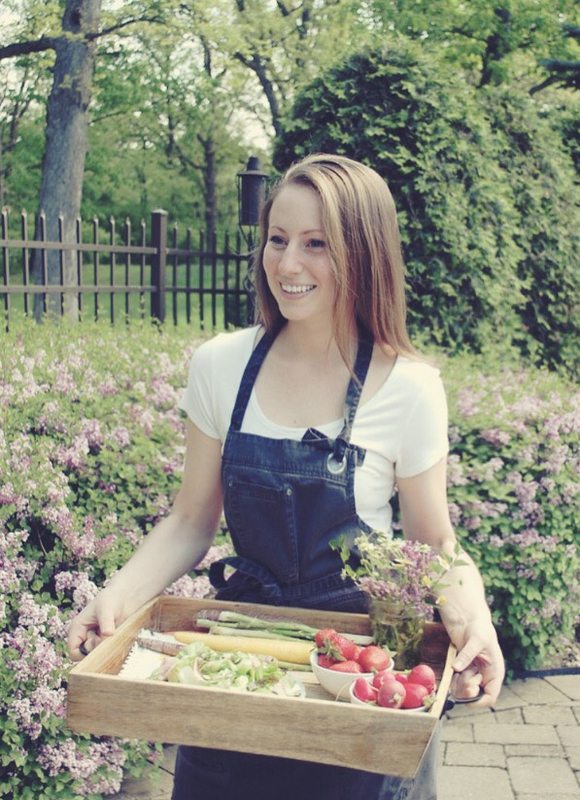 I pack these flavors into a granita, a frozen dessert with an icy consistency. As you take a bite, you are hit with flaky ice crystals that soon melt into a smooth sensation. The watermelon gives the dish its refreshing quality, while the raspberries add a tartness and vibrant color. 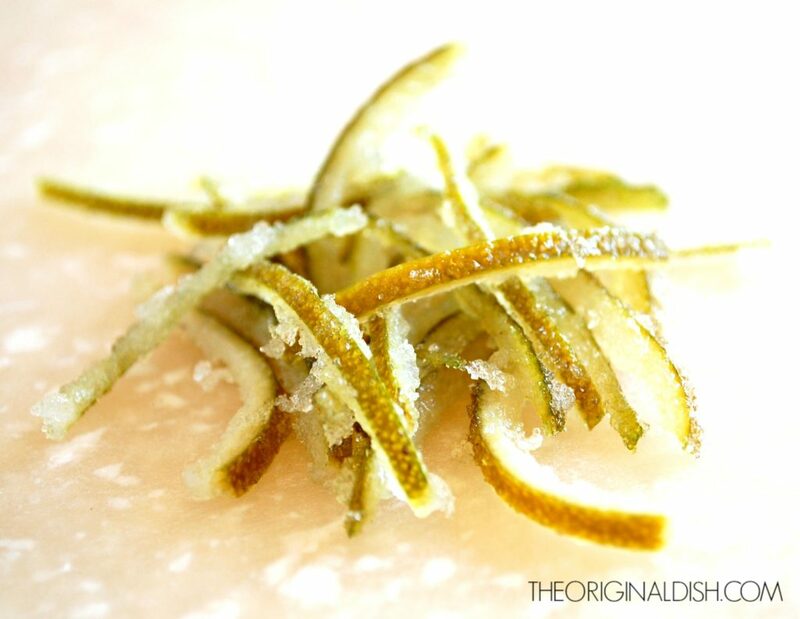 I use lime juice and lime zest in the granita itself, and for a special touch, I candy some strips of lime peel as a garnish. After boiling the zest to soften it and then coating it with sugar (I explain the full process in the recipe), it turns into an edible treat for the top of the granita. Lastly, the mint! I infuse the mint into a simple syrup that is blended with the fruit. The subtle hint of fresh mint is the perfect finish to this dessert. In a small saucepan, combine the sugar, water, and mint leaves, and bring to a boil. Reduce to a simmer and cook for about 3 minutes until the sugar is dissolved. Set the mint simple syrup aside to cool. 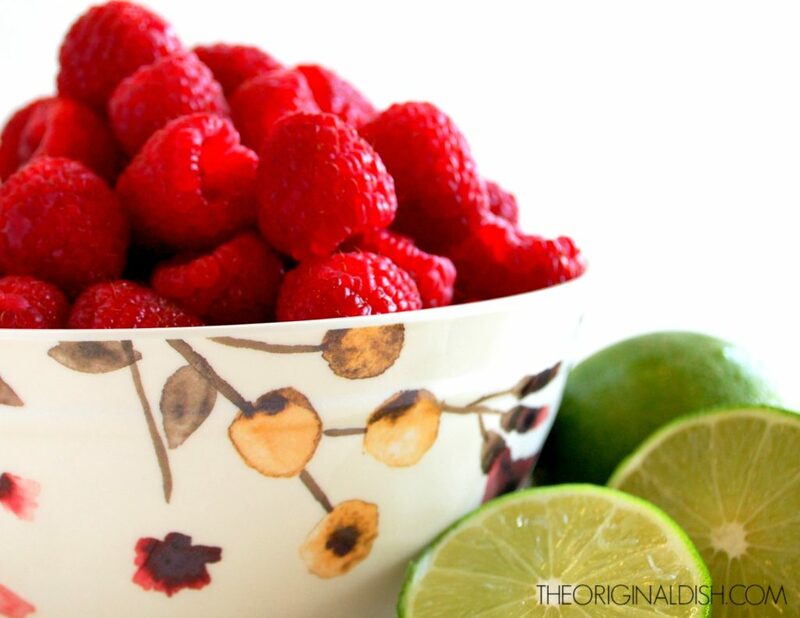 In a blender (or food processor), combine the watermelon, raspberries, lime juice, lime zest, and salt. Add in a ¼ cup of the mint simple syrup and blend until smooth (save the rest of the syrup for the candied lime peel). Pour the mixture into a 9×13 glass or stainless steel baking dish. Freeze for 2 hours. 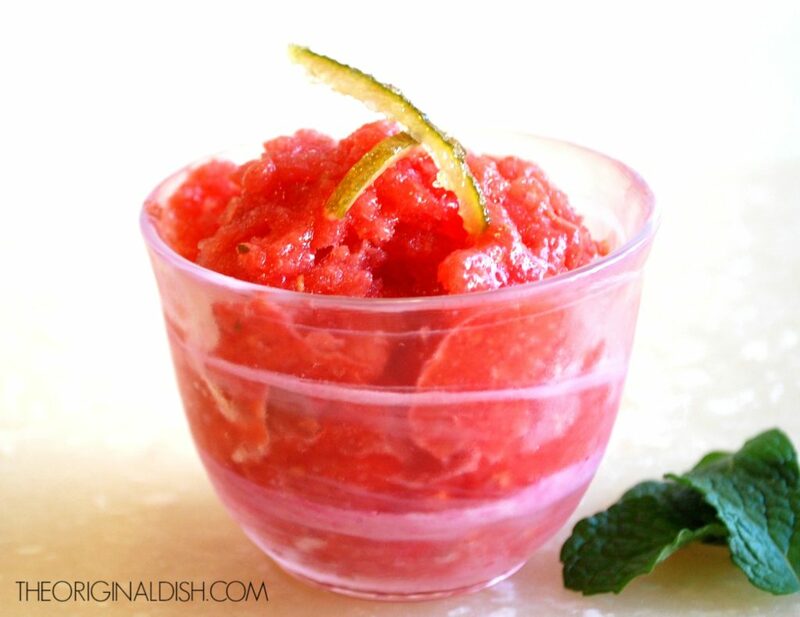 Scrape the granita with a fork. Freeze again until completely icy, scraping every hour (this process should take about 5 hours total). Meanwhile, bring a small saucepan of water to a boil. Add the lime peel and boil for 1 minute. Using a slotted spoon, remove the peel to an ice bath (see Fresh Corn Salad for ice bath instructions). While the peel cools, bring the rest of the mint simple syrup back to a boil. Drain the peel and add it to the simply syrup. Simmer it for about 8-10 minutes. Transfer the peel to a wire rack to dry. Toss it with a tablespoon of sugar to finish. 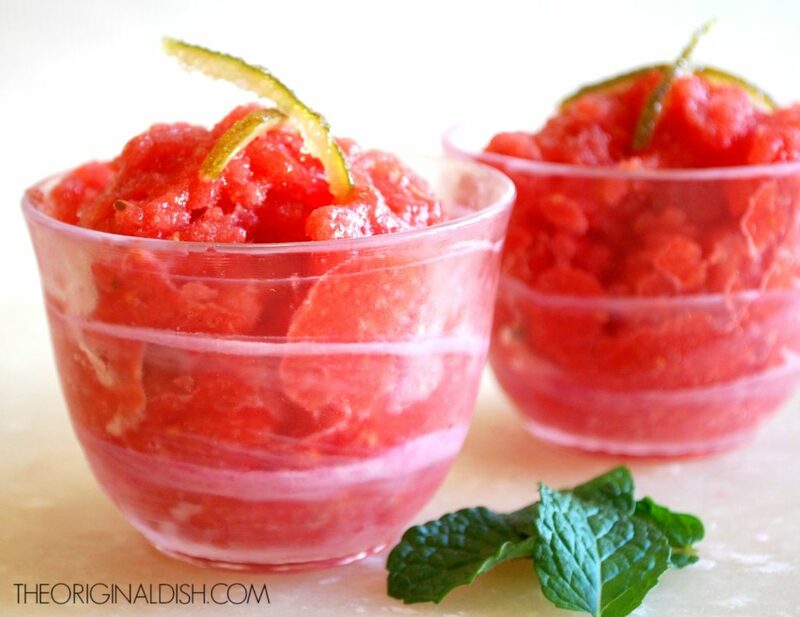 Scrape the granita into bowls and garnish with a few strips of candied lime peel. To make the strips of lime peel, first cut off both ends of the lime. Lay one of the flat ends down, and start cutting the peel from top to bottom, working your way around the lime. Once the peel is removed from the lime, thinly slice it so that you end up with strips of peel. 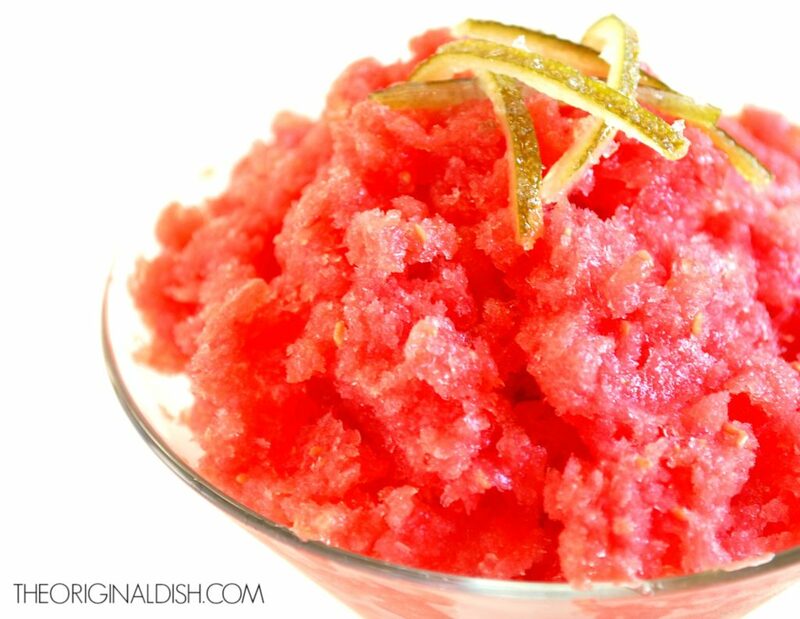 If you want a smoother granita, strain the fruit mixture after everything is blended. This will create an even consistency. I usually skip this step and just go straight from the blender to the baking dish. It just depends on what you prefer. The freezing process will vary depending on how much fruit mixture you have and what size baking dish you use. If you cut this recipe in half, you will want to use a smaller dish or cut down the freezing time. Likewise, doubling the recipe will call for a larger dish or longer freezing time. Either way, continuously check on the granita and scrape it as needed.